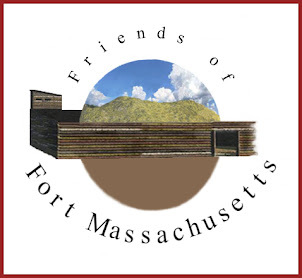 Here is the speech delivered at the Commemoration of the 270th Anniversary of the Siege of Fort Massachusetts––on August 20, 2016, at Indian Ledge in North Adams, Massachusetts––by Craig Chicoine, president of the Friends of Fort Massachusetts. Halfway between Williamstown and North Adams, there lies hidden and long forgotten, a vague marker on a small boulder, at the back end of a nearly vacant parking lot, commemorating Fort Massachusetts and its defenders. There is nothing there telling us what war this fort was built for. And nothing telling us what had actually taken place on this site––only that there must have been some conflict between the fort's inhabitants and, presumably, their enemy: a “scene of their struggle in the wilderness,” as the plaque indicates. But nowhere does it tell us what that struggle was. To the left of this commemorative boulder there is a fireplace and chimney. It is what remains from the replica fort that was built there in the 1930's, by the Fort Massachusetts Historical Society. On what would be the outside of it, there is a small sign that reads, “Fort Massachusetts 1745”––shedding some light on the fort's construction date. What the boulder's plaque commemorates is the siege that took place there during the French and Indian Wars––why we are gathered here today, in observance of the thirty brave individuals' trials and tribulations. Every historical site has an important story to tell. The story of Fort Massachusetts is a compelling, suspenseful, and inspiring story. It speaks of hope and courage, and maintaining one's integrity in the face of adversity. It's a story of life and death and the human spirit. It is a story worth hearing. There was much more to Fort Massachusetts than the Siege of 1746. There were ambushes, and one more attack where they successfully defended the fort and succeeded in driving off the enemy. The first English settlers in this area were the soldiers and their families, helping to clear the way for further European settlement into this region. In fact, in the spring of 1746, one of the soldiers, John Perry––a carpenter by trade, who helped construct this and other nearby forts––picked himself out a plot of land just down the road from here, in the eastern portion of Blackinton, and built a house on it for he and his wife. After the siege, it was pillaged and burned to the ground along with the fort. Some of the original proprietors of the entire township of West Hoosac––now Williamstown––were soldiers of the fort. God's Acre–the burial ground for the soldiers and their families who died while stationed there at Fort Massachusetts––was the first cemetery in the northern Berkshires. Although it had been brought up in the early eighteen hundreds, it wasn't until 1859 that the site was properly acknowledged with the planting of a memorial tree, an elm tree, by Professor Arthur Perry of Williams College––aptly referred to as Perry's Elm. It was planted in what was the middle of the parade-ground within the original fort. In 1897, a flagstaff was raised nearby. And then, in 1933, a replica fort was built, housing the first local history museum in the area. And, in 1976, the Fort Massachusetts Chapter of the Daughters of the American Revolution set a boulder on the site with a bronze tablet commemorating the fort and its defenders. Gradually, the site fell into ruin. Until, in the spring of 2012, a group of Price Chopper employees took it upon themselves to reclaim and rescue this historic site from what seemed like decades worth of trash and foliage overgrowth. They trail-blazed the way for us, the Friends of Fort Massachusetts, to carry on their endeavor, to preserve the site as a park. With the closing of the former Price Chopper in February of 2016, there had been some concern as to fate of the site. That is where the Friends of Fort Massachusetts come in. Our vision is to preserve the site of Fort Massachusetts as a public park––the Fort Massachusetts Memorial Park.